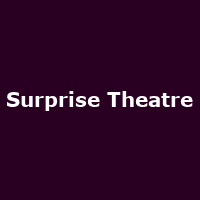 "Exactly what it says on the tin: a different surprise performance each night, from writers and theatre-makers with thrillingly distinctive voices. That's all we're saying. Every Monday and Tuesday nights during Open Court, there will be a different surprise performance from a diverse and wide-ranging field of writers and theatre-makers; each creating a unique one-off performance, which will remain a mystery to its audience right up until the lights go down. Each surprise will be performed twice-nightly and the performance will be live-streamed and available to view for the duration of the festival on the Royal Court website."